Three priests in the Philippines, known for being outspoken against a wave of drug-related killings in the country, claim they have received death threats in recent weeks. Source: ucanews.com. 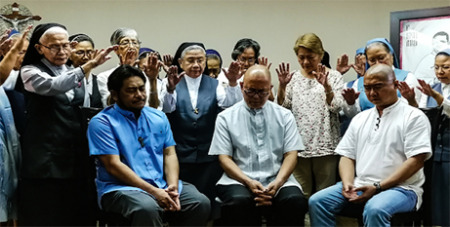 Jesuit Fr Albert Alejo, Divine Word Missionary Flavie Villanueva, and diocesan priest Fr Robert Reyes told a hastily organised media briefing on Monday that they are in fear of their lives. “We’re not safe,” said Fr Reyes, known as the “running priest” for his penchant to go on long-distance runs to draw attention to human rights issues. The government has acknowledged the deaths of 5,176 “drug personalities” in 119,841 anti-narcotics operations since July 1, 2016, when President Rodrigo Duterte came to power. The threats against the three priests come soon after Bishop Pablo Virgilio David of Kalookan, the diocese where most drug-related killings have occurred, and Archbishop Socrates Villegas of Lingayen-Dagupan, a vocal critic of Mr Duterte, announced that they had also received death threats. “The deadly words of Duterte against Catholics are like a dagger pointed at us,” Fr Reyes said. Mr Duterte has repeatedly lambasted the Catholic Church and its leaders for being corrupt. He even said bishops should be killed in one of his public appearances. “The message is clear. It’s not only people that [Mr Duterte] wants dead but our faith as well,” said Fr Reyes.